This book presents the state-of-the-art polymerization, fabrication and application methods of high performance industrial polymers, pertaining specifically to recent developments from the chemistry and engineering perspective. All introductory, monomer, polymerization and fabrication techniques are reviewed, and basic information is provided to help demystify the more advanced material. Chapters are arranged according to chemical constitution of the individual classes, starting with main chain carbon-carbon polymers and leading to ether-containing, sulphur-containing, and so on. Special additives, suppliers and commercial grades, safety, environmental impact and recycling are also explained. 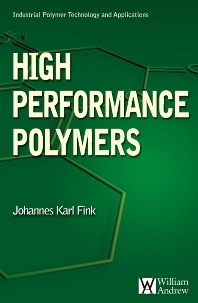 Commercially available polymers are listed throughout the book. Engineers in industry -- Automotive and aerospace industry, Fiber technology, Coating technology, Electrical and electronic industry, Sensor technology, Fuel cell technology, Gas separation technology, Vacuum technology, Cooking ware manufacturers, Manufacturers for photovoltaic devices, Manufacturers for data storage, Manufacturers for medical instruments, Manufacturers of optical wave guides, Sailcloth manufacture.